15mm rods + ff + still lenses? I just received some Les Bosher made brand new 15mm rods and interface plate. Well built and nice. Now I'm just left wondering if there are any follow focus units available that would work well with my setup of these rods and Contax Zeiss lenses. There would be no problems with PL-mount cine lenses (which are long enough and have the focus ring near the front), but with my current SLR lenses I think most of the follow focus units available couldn't be fit close enough to the lens to be used. Any ideas? There are FFs that may work, but they are more expensive. The Zeiss superspeeds that you probably want, and which might be a logical thing to use if you wanted a set that could mount easily to the ACL, all have the focus ring behind the iris ring (at least my MKIIs do, I think they all do. It is a generic problem (I think) with mounting a FF to a camera with a spining mirror. With a short lens one can run out of space to mount FF and matte box. Even with ACL, with an oscillating mirror, one seems to run out of space. Wierd really, when you think of all that space that an oscillating vs spinning mirror has saved. Is Les just being lazy, or trying to make a rod base that he can use for ACL I and II by just inverting the rods on the mount? Such questions. For ACL I there is a lot of space wasted on that rod base. ACL II, the designers never imagined that someone would be mounting a rod base and that the little foot on the ACL II would waste so much space. None of this is hard if you or a friend have some metal workshop skills. For me, I found that the common geometry for basic follow FFs (and even Arri make them) with the drive gear offset from the gearbox, give a problem with using up available space. Most FFs with a swingarm might work. The drivegear normally can mount either side of the swingarm, so that saves space. Problem is the cost vs quality. Chrosziel make good ones. Old Arri will not fit your rods and will be too heavy. Some used Chrosziel ones sell for about $1000 sometimes on eBay. Old Cinetech may be OK but where from the parts? Petroff made an interesting one years ago, then stolen by Cavision (he said). Cavisions's offerings looked to have obvious design defects. Then there were the Indians. Proaim made one that looked like a Chrosziel clone. I bought one for $16 recently, to have a look. It would actually be a really usefull tool, but they had put a plastic gear in the gearbox, and a couple of other parts made in plastic that should not have been. Tilta put out their version. I haven't seen one in the flesh, but the photos look as if the design is affected, heavier than nescessary. Best advice, wait for a Chrosziel swingarm FF on eBay. Almost forgot. A good FF design has a way of adjusting gear clearance in the gearbox. Otherwise you have to replace the gears a lot. Also, With a basic rodd mounted matte box, a Ff with offset drive gear may work, or not. If you have a swing away box then the available space gets eaten up from both ends. Attached is a pic of ACL II with Les B rods/base (higher than ACL I), cheap FF with offset drive gear. Lens is 8mm Zeiss, cousin of the SSs, slightly shorter than SS. The FF will fit OK, but the swing away MB could not come back far enough. Gregg, regarding your idea to make a new mounting hole: unfortunately the mounting hole for the camera and the hole for the tripod are too close to each other. There is no space for a new hole. I sent Les an email and the photos to ask if he thinks superspeeds + ff work with this setup. Haven't received any answer yet, I think I'll call him tomorrow. I'm a bit surprised if this hasn't been taken into consideration... after all, isn't the most common reason to have rods installed in order to have the full spectrum of accessories including follow focus installable on the camera? Does Contax C/Y have a 45.5mm FFD? So your focus gear is probably sitting 6.5mm further back. Although I whinged about the offset drive gear on cheap FFs, the offset could actually put the gear where you need it. Just make sure that the matte box system will fit far enough back. A swing away arm probably wont. There are a couple of ideas on how to shift the rod mount to the rear. But first, unless you are going to modify the vertical plate to improve access to the switch you need to experiment to find the minimum space required to easily find that switch. You can just sit the camera on the plate and vary the gap 'till you see what feels ok. The 3/8" threaded "hole for the tripod", if the camera was mounted to that one how would the gap, finger access be. It's easy enough to mod that hole, then make another 3/8" threaded hole further forward. Do you have some kind of dovetail plate in your system to balance the camera? If by experiment you know exactly how much you want to shift the rod mount, you could just trim that much off the front of the base plate. You probably will have to deepen the holes for the cap screws and extend those threads. Or you could custom make a base plate. It's the easiest part to make in that whole system. Maybe Les can swap your plate for another. The Zeiss Contax lenses have a good broad focus ring and it's reasonably far out from the lens mount because the scale is at the rear. The bars in your pictures look OK for use with a FF on a zoom lens, but for prime lenses you really need to get the bars as close to the camera body as possible. As Gregg says you may have to do a bit of custom machining.possibly drilling tapping a tripod mount thread into the plate. However, if it's aluminum it may not take too much wear, so perhaps a steel threaded insert may be needed for the tripod screw hole,. I called Les and we'll look in to having gears installed on my Contax Zeiss lenses. As for Zeiss Superspeeds, he didn't remember anyone having problems with his design. I guess I'll have to try to find a PL adapter and just test my camera with them. Any idea if one of these would work: http://vandiemenbroadcast.co.uk/epages/eshop406899.sf/en_GB/?ObjectPath=/Shops/eshop406899/Products/%22PL%20Mount%20Adapter%20%28came%29%22 ? From their photos I don't get how that fits to a CA-1 (Cameflex) camera port. Honestly, a PL/TS-1 adapter that removes that extra step is better. Les's mount is good but a bit expensive. If you can find a used adapter that is well made and cheaper, good. I sent you an email. I have a good stainless steel PL/TS-1 adapter I might sell. Gregg, I just bought an ACL 1.5 S16 and was wondering if the item you mention is what they call in the manual the "Intermediate mount for lenses in Arriflex mount"? My camera comes c mount only so I've been trying to figure out what I could use to adapt other lenses since there are so many lenses in PL mount. I've seen what Les, VP and MTF put out in terms of adapters for using PL lenses on c mount cameras but haven't seen what you mention. Thanks! I looked at the various manuals and sales pamphlets. "Intermediate mount" is one of the terms used for what is often called a PL or Arri-B/S, CA-1....etc... to ACL (or TS-1) adapter. It's all a bit confusing. The ACL has a big stainless flange attached to the aluminum camera body with screws. This is the TS-1 mount. Eclair designed or commissioned several "adapters" that screw onto the outer thread of that. It's a large diameter flange and thread, so it's strong and stiff. If the TS-1 flange and the adapter are good for FFD, then this is a great system, capable of mounting almost any lens. If anyone finds an original adapter with incorrect distance from flange to flange please let me know. There are often some cheaper adapters that will screw to the C mount. If you can, avoid these. It depends on what you can afford I suppose. Coming back to your original question. Les Bosher makes a great PL/TS-1 adapter. A bit expensive new. There were some others that made other versions. I have had three other versions, but maybe they were not widely produced. I have one surplus now that I might sell. Email me if interested ....viz@xtra.co.nz. I have some other S16 ACL stuff, French 400' mags etc. Thanks for the info. I was wondering if what you had was an Eclair mount. But from what you said I get it's third party adapter. I don't have the camera yet but when I read the part in the manual about the TS mount etc it's hard for me to know exactly how it works so yes, I do find it confusing. The other thing that makes it confusing is for a vendor to have their own mount that you need an adapter for. Most of the adapters I mention above are really expensive though that's a relative term. Coming from large format photography I thought I knew what expensive lenses were but my recent forays into this world have made it clear that I was clueless. Especially when you're talking S16. I'm about to go on vacation but as soon as I get back I'll be getting in touch with Seth at Americancinespec to get rods for my camera. Brian, I think previously you mentioned that you used to have some Zeiss Contax C/Y and an adapter for your Aaton. Sorry if this has been asked before, but were they a reasonable match in practice with the superspeeds that I'm guessing you used for the wider lenses? Did you or your tech ever have a look to compare these on the lens projector? In practice they were a good match, I didn't get a chance to check them through a lens projector, but looking through the Aaton viewfinder wide open they were slightly softer than my Super Speeds, but became closer when stopped down. I felt they were half way between my Zeiss 10-100mm T2 zoom and the Super Speeds. The 35mm f1.4 had a touch of barrel distortion compared to the 25mm Super Speed Distagon in the 16mm lens set. I worried a bit whether or not a follow focus would reach the focus ring on PL-mount primes. Fortunately it was unnecessary. 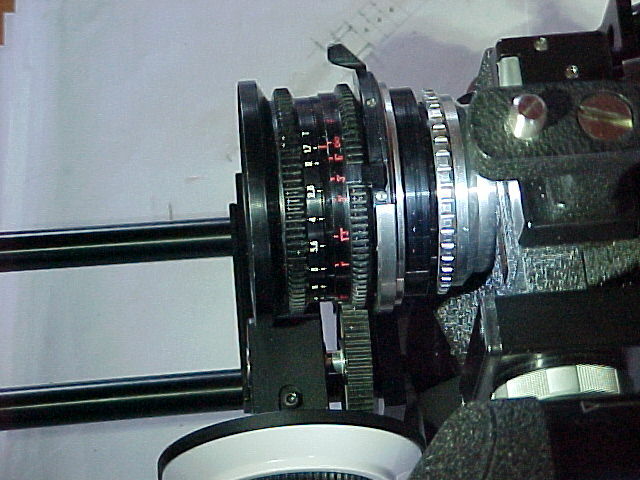 Even with a narrow gear the Chrosziel follow focus reached the focus ring on the Optar Illumina primes. We had to use a clip-on mattebox, as the Chrosziel 4x5.65" would hit the other end of the rods and thus not get close enough to the lens. To sum it up: Les Bosher 15mm rod base for Eclair ACL works fine with PL-lenses and follow focus equipment. isn't your summary actually close to the begining point we had some time ago. The only doubt I had was how much room there would be for some rod mounted matte box's. Hey, did I read that you got a Chrosziel FF with a swing arm (203-01S or 204-01S?). Can you tell if it has an eccentric adjustment for the gearbox gear clearances? It's a rental house owned FF and I didn't even operate it, only my AC did so I really don't know the details. Sorry. But yes, you are correct that how the things turned out was very close to some ideas presented earlier in this thread.